Your immune system does a good job in protecting you from disease-causing organisms. Sometimes, a germ could successfully invade your system and cause you to fall ill. To boost your immune system, you will need to adopt a much healthier lifestyle that to keep you strong and healthy. Thus, the immune system will function much better when well protected. Some healthy living strategies include a healthy diet comprising of fruits, vegetables, whole grains and low fats, regular exercise, enough sleep, adequate hydration and hygiene habits to avoid infection. Aging can sometimes reduce the capability of our immune system which could lead to more infections and more diseases like cancer. This can reduce the longevity of one’s life. The immune response in aging parties can sometimes be improved by nutrition changes. Coriolus versicolor is an extract obtained from mushrooms that offers benefits to the immune system. It is also referred to as the turkey tail mushroom and contains large amounts of Beta-glucans that stimulate the immune system. This is a protein-bound polysaccharide known as Polysaccharide-K (PSK) and once extracted from the mycelia of the mushroom, can be ingested alone in form of a capsule or tablet to boost the host’s immune system. Turkey tail mushroom also contains Polysaccharide-peptides (PSP) that stimulates the body to respond to infections or diseases. Coriolus versicolor helps increase and activate natural killer cells. These help in protecting the patient from further tumorous growth and infected cells. The Cancer Immunology and Immunotherapy journal reports on randomized blind trials using Coriolus versicolor conducted on 111 patients who had colorectal cancer. It showed an enhancement in the patients’ white blood cells. The white cells had the ability to scavenge for toxins and kill any pathogens. Coriolus has also been used as a helpful maintenance therapy post cancer surgery. Research also shows that Coriolus helps in protecting the immune system’s activity from being suppressed. PRO-IMMUNE GOLD is a product from Mushroom Remedy that combines the most potent strains of Coriolus versicolor and Ganoderma lucidum. It contains Polysaccharide-peptides (PSP), Polysaccharide-K (PSK) and Triterpenes whose combination gives the best immune boosting effects. These elements have been used for medicinal purposes for over a thousand years and have been studied to provide immune stimulating benefits. PRO-IMMUNE GOLD is 100% all natural. It is also NON_GMO, gluten free and vegan. 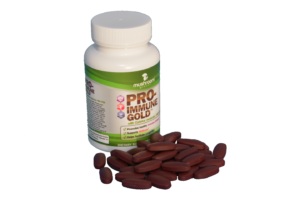 PRO-IMMUNE GOLD has been created to help in boosting your immune system. Major benefits include promoting a healthy immune system, facilitating longevity and supporting overall wellness. The information and statements presented here have not been evaluated by the Food & Drug Administration. These products are not intended to diagnose, treat, cure, or prevent any disease. Copyright © 2019 Mushroom Remedy LLC. All Rights Reserved.